Hycilla offers 1,300 sq ft (NIA) of office space, which can be configured for up to 10 people. 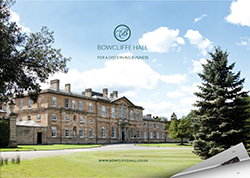 With a private garden terrace, the office benefits from natural daylight, kitchen facilities and an additional lower ground storage area, all within easy reach of Bowcliffe Hall and your own private members’ club, the Bowcliffe Drivers’ Club. Fill in the form below to enquire about Hycilla. We’ll get right back to you. If you’d prefer a chat, call us on 01937 541111.